Barcelona? What this city truly looks like? Happy, full of flavours & great places. That how we remembered it & we don’t wanna change that! Barcelona isn’t the capital of Spain, but… in our hearts it has the first place! Everyone needs to find something for yourself during holidays in this city. Discover Barcelona with us! WHY YOU NEED TO GO BOOK A TICKET & VISIT BARCELONA! FIND OUR 16 REASONS BELOW! The same feeling, that appeared during our visit in Roma. You walk & you experience a magical adventure! Beautifully decorated townhouses, marble details, dangling flowers from balconies, palm trees… We love it! A true paradise for all the foodies is located at La Rambla! On this market you’ll absolutely everything: fruits, vegetables, fish, seafood, ice creams, meat, cheese, bread, sweets… A cult place, not only for tourists, but also for locals. Must see! “Spanish donuts” that you need to try. You will find them almost at every corner, in various configurations and flavors. Flushed with chocolate, caramel… and more! A beachside area where you have to spend an hour. There is nothing more beautiful than drinking wine and looking at the spreading sea landscape. Going on the promenade of La Barceloneta you feel the spirit of this city – it is energetic, it is brisk, it is beautiful and surprising! The church is the greatest achievement of Antoni Gaudi. If you are looking for inspiration – visit this place. Nature intertwines with architectural cradles, which entails total delight. What is important – SAGRADA FAMILIA is still a construction site. It is estimated that the construction of this “organism” will end in 2028! It is worth booking at least one day early on the internet to avoid waiting in long queues in front of the temple. Ohhhhhh Guadi! Why are you doing this to us? Another place designed by you is the location we want to return! Looking at photos from this area, you are one step away from booking your ticket for another trip to Barcelona, really! This unusual place is also Casa-Museu Gaudí – the building where Gaudi lived before moving to the Sagrada Familia area. Spain & Barcelona – delicious & fresh bread baked according to traditional recipes and aromatic wine. We never suspected that a sandwich with freshly cut meat and a glass of red wine could taste so well. See for yourself! Being in one of the cafes we were warned by the owners of the pickpockets all over the city. Remember it! Hide your wallets wherever possible and do not place them on tables in restaurants or other places where you focus on eating rather than watching your surroundings. The native Spaniard told us, that being in Barcelona and not eating PAELLA is a total faux-pas! So we went for such a seafood version. Spanish cuisine really can be loved! This city is alive! Not only by the millions of tourists visiting Barcelona every year, but also by the murals! Colorful walls, faces of famous people on the walls, floristic patterns, magic! Blanket & food & drink & green grass is the way to a successful afternoon. This park is really gigantic! Do not get lost! Of course, we assume that no one will miss this point by visiting Barcelona. Frozen yoghurt. It will probably find its followers. In the plastic cup you receive a portion of really creamy ice cream, and the additions to them are optional. Similar rules as in other places this type. Baked dumplings with meat stuffing with vegetables or cheese.Very good ones we ate at MUCCI’S on La Rambla. We visited this place once & left this without buying anything (#HealthyFitLife). Okay, but we weren’t very strong and came back a few hours later! 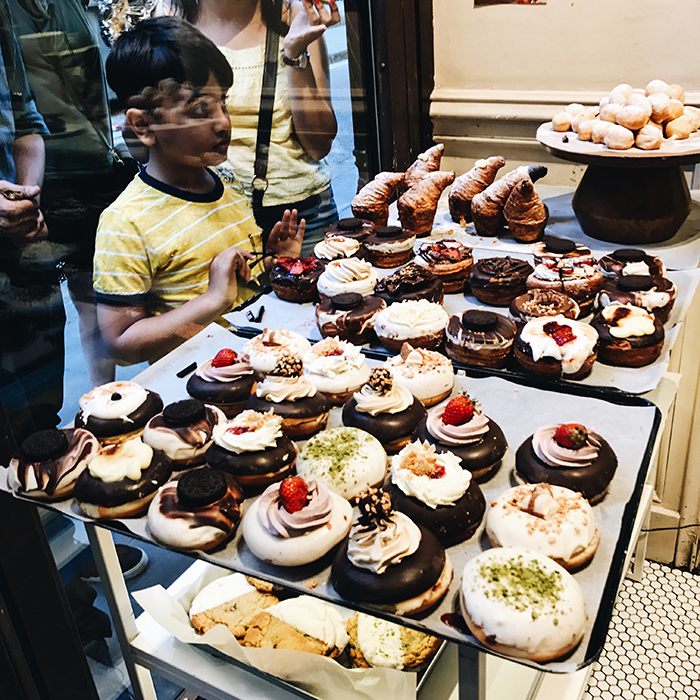 Fábrica de Chocolate (Carrer de Carme, 3) – what Willy Wonka experienced… is nothing! This place is a foodporn that you have to try! Donuts with oreo, chilli chocolates, colorful lollipops flooded with various kinds of tasty masses, donuts, croissants… True paradise! Here we recommend going during sunset. However, this view is not the only attraction that can be seen in Parc de Montjuic. In the evening you can see there a great performance with fountain as the main star! Flashing lights, thousands of people, water striking and dancing to the rhythm of music… To test and verify with your own eyes. Eat fruits, try vegetables – especially the seasonal ones. They are juicy, they are superfluous and you will be amazed at their taste. Important point – if you go in very warm months – DRINK WATER. The heat can really get stuck, and we all want you to be fine there. Go to untypical places, order tapas to taste this city as much as possible. Tapas are also pretty cool option to eat and save money. If you are sensible in ordering them, and there is no mathematical potential in your soul – it could be very economic! There was a lot of it. However, all these things guaranteed us unearthly time in Barcelona. It’s a place with a climate! Totally in #MYTUJEMY style. We found there chillout elements, good food and magical atmosphere. Remember to upload your photos (not just foodie) with #MYTUJEMY hashtag.. We like to browse and we are always happy when we see you are following our travels too!